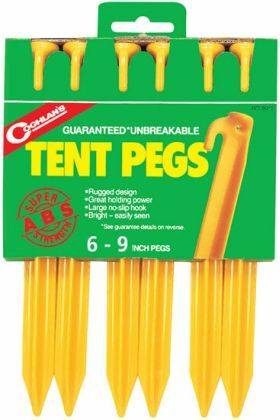 9 inch ABS plastic tent pegs with a rugged design and no slip hook (in a 6-pack). These tent stakes are bright and easily seen. You can make tent stakes out of sticks in the wild but these are so lightweight you may as well bring 'em along. When the wind is blowing and your tarp is flying, you need to make sure you got it staked in good. Especially if it's raining! You don't want to have to readjust or re-pound down your shelter. Put these in your pack and never worry about having to find or make tent pegs.